Every summer, San Diego politics is consumed with drama. It seems clear we have this year’s opera queued up: the negotiations to transfer stadium land from the city to San Diego State University. Voters solidly supported Measure G, which provided some parameters to do this, but as we pointed out after the vote, there are open questions about exactly what terms the sale should include. Representatives from the university and the city have met a few times to set up some basics for how and when they will discuss these things. But the real talks have not begun and they already hit a snag this week. 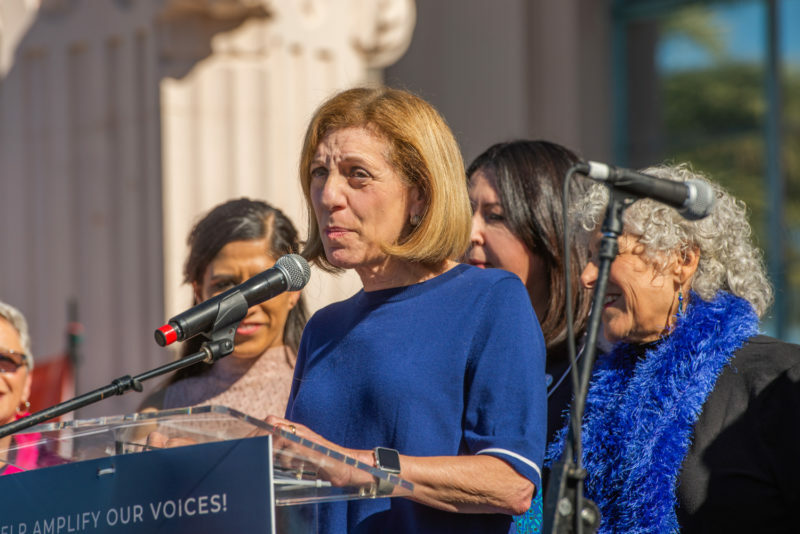 Wednesday: Councilwoman Barbara Bry led a push at the City Council’s budget committee to squash the mayor’s proposed contract with the real estate firm Jones Lang LaSalle. The mayor wanted the Council to approve up to $500,000 for negotiations on the project to let the firm sit on his team across the table from SDSU. SDSU seemed on board with this as the two sides released the list of their negotiators. The university’s list includes several outside consultants of its own, including lawyers and developer John Kratzer. Bry says it’s no big deal: “This is not that complex,” Bry said in the committee meeting, deriding the city’s need for a new consultant. She elaborated on social media: “Fact is, San Diego voters already approved the key deal points, an independent appraisal has already been completed and SDSU’s plans have been made public,” Bry wrote. There’s a lot of news in that sentence: It would be new to us, at least, to know that SDSU and the city agreed that the appraisal of the land that was drawn up for SoccerCity in 2017 was now the guiding assessment of the “fair market value” SDSU will pay for the land. Also news to us would be that key deal points were already settled. One big question not settled: What about the giant river park promised in the deal? The measure only said that SDSU would cause the park to be developed. But the measure specifically left out that land for that park. It would remain the city’s land. So we always wondered who would build the park and who would maintain it. As Kratzer explained to us, the Friends of SDSU group putting together the plan believed the city would want to keep ownership of the park. And then Gina Jacobs, the university’s vice president for business and financial affairs and a member of the negotiating team, told us last year that this would be worked out in the negotiations. “It would be in our sales agreement with the city. I mean we would have to sit down and negotiate the sale of the property. We would come to the agreement what fair market value is. In fact, if they want to put in there that you will build the park, it would be done,” Jacobs said. In other words, there are big decisions to be made. What’s really going on? It seems like there’s a deeper dispute revealing itself. We agree with Bry that the city and SDSU should be acting like partners, not adversaries. But even if they sang songs and played guitar together all day long, there are a lot of things to work out and it seems reasonable for both sides to bring in a couple experts. For one thing, arguably the worst scandals the mayor has faced have been about his handling of real estate assets. The purchase of a tower downtown for city workers and the infamous indoor skydiving center for use as a homeless skydiving center come to mind. So why the intense pushback on him seeking advisers on this? It seems more about lingering questions of who is really in charge of this deal. Measure G specifically said SDSU would pay what the City Council decided was a fair price for the land. Is the Council itching to cut the mayor out of this lead role in the negotiations? Bry really wanted to be on the negotiating team. City Attorney Mara Elliott said no: Remember Elliott still thinks Measure G was illegal but the Council and mayor effectively told her to drop her lawsuit. She continues to insist on the core principal of her argument: that the measure could not take away any of the jobs the mayor and Council are required to do by the City Charter. And one of the things the mayor gets to do in the City Charter is negotiate land sales before taking a deal to the City Council for approval. Elliott issued a firm opinion in January saying this was the mayor’s role and Council would have to stay out. She did say the mayor could keep the Council informed and Monday, a couple of Council members, not just Bry, were frustrated the mayor hasn’t done that. Thursday, Elliott followed up her opinion with an update stressing that the mayor could update the Council. Her memo communicates that the intent of the charter is to separate the powers of the mayor and Council so they can act as checks and balances. “In light of this separation of authority, it is improper for an individual Councilmember — or the Council as a whole — to become involved in the City’s administrative affairs, including contract negotiations, although the Mayor may keep the Council apprised of such negotiations,” the opinion states. Six months ago, attempts to connect the trolley to the airport were not going well. Public agencies were trading sternly worded letters and discussions weren’t going anywhere. At SANDAG’s annual retreat Friday, regional leaders spent the day breaking down the possibilities on a project that’s suddenly become a major priority, and couldn’t stop reminding one another how bad things had been. But for all the goodwill, Friday’s meeting made clear that there are still plenty of disagreements about how to best proceed. Brass tacks: A SANDAG subcommittee is working on a plan it hopes to present by June. Faulconer and SANDAG Director Hasan Ikhrata have zeroed in on what they call San Diego Grand Central, a new transit terminal at the current SPAWAR location in Old Town that would connect to the airport terminals. 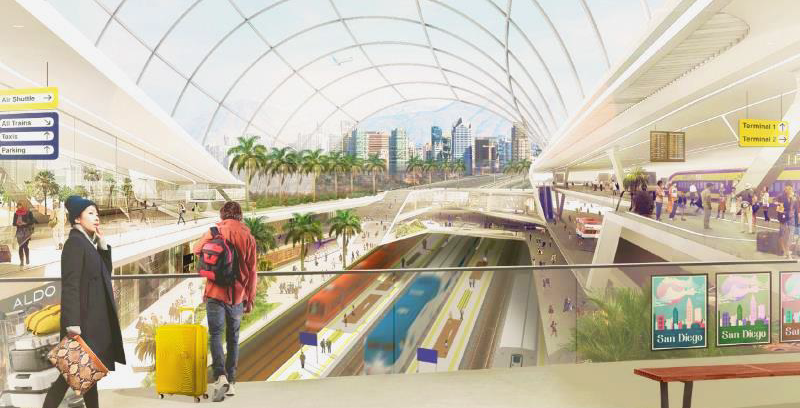 SANDAG asked private companies for their ideas on the best technology for an airport-transit solution, and presented those results Friday. It’ll do the same next month with the results from a call for ideas on where and how it should build a new transit terminal. Autonomous vehicles: SANDAG staff said one idea they latched onto was the possibility of using autonomous vehicles – possibly on a dedicated right of way – to connect a nearby transit station with the airport, rather than the more typical people-mover trains at many airports. Autonomous vehicles were a recurring conversation throughout SANDAG’s retreat, even as the industry is increasingly acknowledging the technology may be further away than boosters previously suggested. Ikhrata isn’t budging: Ikhrata outlined a simple – and ambitious – result for any project: It has to be capable of getting any person in San Diego County to the airport by transit with one connection or less. Anything less wasn’t worth the effort, he said. He has clearly already concluded that the only way to do that is by committing to his Grand Central concept. Anytime another suggestion came up: building the station elsewhere, implementing smaller solutions first and scaling them up – he’d give it a token nod and reiterate that Grand Central would indeed take a long time and be expensive, but that’s the cost of building great things. La Mesa Councilman Colin Parent said the priority needs to be making sure a transit connection to the airport happens – not necessarily building a new transit station as a part of the project. “Multi-modal centers are great, but they’re gravy,” he said. He said it makes more sense to focus on the airport building a people-mover to an existing transit station, and if Grand Central ever actually happens, the region can extend the people mover to it. Ikhrata wasn’t biting. Even iterative steps would be expensive, he pointed out. He allowed for some smaller steps the region could take in the interim – MTS Director Paul Jablonski said the agency supported running a shuttle from the Old Town station to the airport, and Ikhrata said that was a good idea – but he kept his distance from any capital project that wouldn’t make good on his one-transfer promise. One dust-up: Ikhrata’s insistence on focusing on Grand Central led to one testy exchange. County Supervisor Jim Desmond said he still wasn’t convinced that Santa Fe Depot – where multiple trolley and bus lines and the Amtrak and Coaster trains already converge – wasn’t the best place to base a new airport-transit station. He asked that next month, SANDAG include an analysis of Santa Fe Depot in its report on all the possible locations. Ikhrata again steered the conversation back to Grand Central, arguing it alone could achieve the scale the region needed, and cautioning against anything that would lead to a half-commitment that would keep the question unresolved. Ikhrata was undeterred. He said he would, but added that for the Coaster to be a viable airport option for North County residents, it needed to run every five or 10 minutes, and Santa Fe Depot could never handle that capacity. 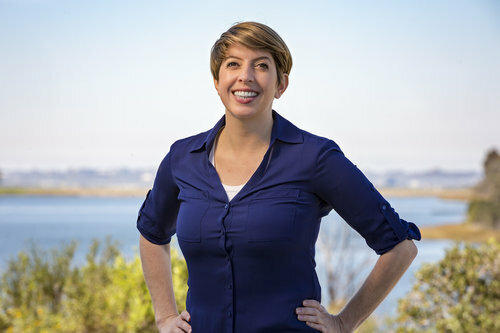 Republicans are still trying to wrap their minds around T.J. Zane not running for San Diego City Council District 5. The longtime party activist announced on Facebook that he was bowing out to focus on his family. Meanwhile, the Dems settled on their lady: Marni von Wilpert. Von Wilpert is a deputy city attorney. She grew up in Scripps Ranch but then left for school and law school and the Peace Corps. She just returned in December 2017 and started her job with the city attorney last June. She’s perfectly candid she came back to run for office and that she got the job at the city attorney’s office to get to know the city’s business. “I moved home knowing that I was going to run for office and I specifically chose to work in city government. I wanted to learn the government that I was going to try to help lead,” she said. She said it was kind of surreal to be running for the seat that Brian Maienschein held while she was a student living at her parents’ house. They supported Maienschein. She’s most interested in protecting the environment and advocating for transit. It’s an interesting pitch for the most conservative, suburban district in San Diego. “My message is about getting options. Pitching it more as creating options for folks has resonated well. It’s not a one-size-fits-all solution,” she said. We talked to Republican Joe Leventhal a couple weeks ago. There are other rumored candidates in the district and we’ll keep an eye out for their announcements. Correction: An earlier version of this post misstated the date and the Council committee that discussed the SDSU deal. The conversation happened during a Wednesday meeting of the budget committee. Correction: The mayor’s request was for a contract for Jones Lang LaSalle for up to $500,000 one time, not per year.